Many landlords like to give a little something to a tenant who’s moving in. The small, personal touch can create a great foot forward at the beginning of the landlord-tenant relationship. For that reason, many landlords put together a tenant welcome basket. While I personally no longer provide welcome baskets for my tenants, after a bad experience. 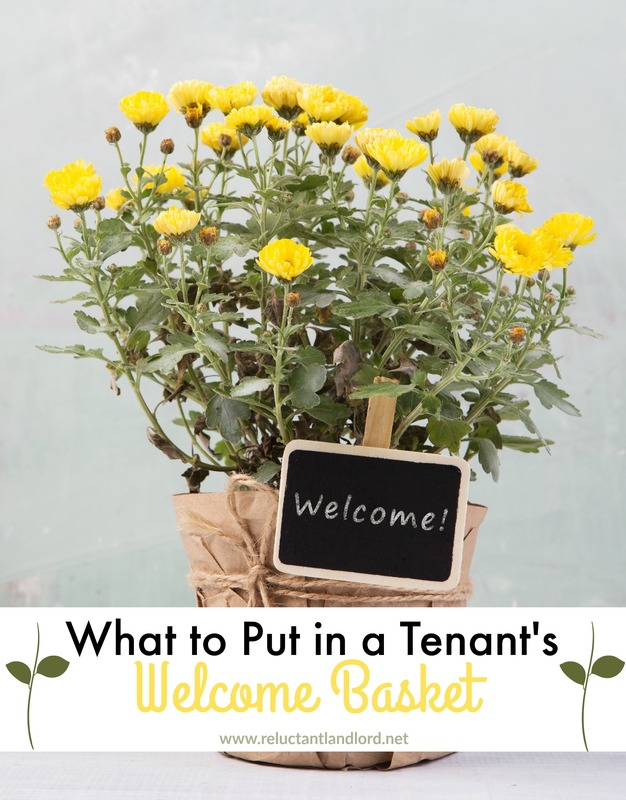 Still there are many more landlords who are huge believer in Welcome Basket’s as they feel they provide a great first impression. Below are some great ideas for those looking to put together their first basket. Fliers – Provide maps, restaurant pamphlets, coupons, and other fliers for your local area. Lists – Create a list of your favorite hole-in-the-wall restaurants or other places for shopping or services that might be off the beaten track. You can also leave a list of the local utility companies and lists of other services they might need. Drinks – A great way to welcome them to their new home is to give them a six-pack of local beer, a bottle of wine, and/or some sparkling apple cider for the children. You can also leave bottles of water or Gatorade in the fridge for them. Snacks – Have a basket of snacks relative to the ages of the children moving into the home. This can keep the kids distracted with new treats during the stressful times of moving and unpacking. Paper/Home Goods – Provide some home goods like sponges, paper towels, hand soaps, toilet paper, or detergents for them to use. This is a very practical gift that will be much appreciated. House Plant – This is a great gift that won’t be much work for them and will add a splash of color to their home. Coffee Mugs with Tea and Coffee – Everyone loves hot liquid, and most people love caffeine. So a great little welcome gift could be a cute coffee mug with some type of tea or coffee. Are you a long distance landlord wanting to send you tenant something nice? Here are some ideas that will show up to there doorsteps, perfect for any place you live. Halmark Ecard– Send a card through email can be much better than mail for those who are getting settled. If you want to do a little more its great to pair with a gift card. FTD Flowers – Sending a vase of flowers through FTD delivered to the new house is nice welcome gesture. Not only does it add a pop of color, but also gives a great fragrance. The best part is it can be done from anywhere so it’s a great gift for landlords managing long distances. Harry and David Basket– Give them a basket with local fruit or the other savory treats that are special to your area. Shari Berry– Yummy Chocolate Covered Goodness that no one with a sweet tooth could ever turn around. Great for even the hardest shoppers! There is no way you can go wrong. PS – Here is a 15% off coupon. Gift Cards 60% off with Restraurant.com – This is a great way to give a family a “first meal” to a local restaurants when they are just moving in with no kitchen supplies yet. The best part is it cheap for you so great for anyone on a budget. Hello Fresh Box – For $105 you can send 3 meals for 4 people. This is great if the tenants haven’t been able to go grocery shopping yet. They still have to prepare the meals, so keep that in mind, but my husband and I absolutely love Hello Fresh Box (read our review). Here is my affiliate code to save $40 on your first box VX9SYF. Never Leave Anything You Would Be Upset Losing or Replacing – I have seen stories where people have left furniture only for it to be sold in a garage sale before they left. Others have been upset when they had to replace an appliance they left since it was not marked AS/IS. If I leave anything that I don’t want to replace I make sure that I mark it “as is” in the lease. Don’t Spend a Lot of Time – I have seen a lot of people upset over spending hours putting together a welcome basket when a tenant not only ignores it, but gripes about other things. While many love the touch, you could get a tenant who does not care about the welcome basket, but does care that you missed a spot in the bathroom. Don’t Treat it as Anything Other Than a Business Relationship – Don’t forget at the end of the day this is a business relationship. I personally prefer keeping my tenants at a distance so “friendships” don’t muddle the relationship. I also find that when things get friendlier, people push more. Good luck and happy landlording! Did I miss any items? Do you include a welcome basket? If so, what do you include? Thanks! Glad you found it helpful!.